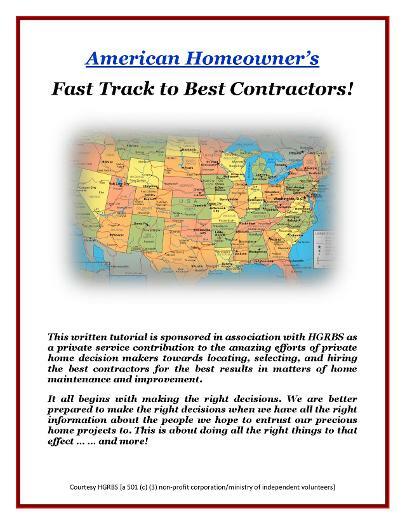 Your "SERVICE BOOKLET" is a useful free online tutorial developed by independent volunteers in association with HGRBS which enables US private home heads to make safer and wiser decisions about contractor candidates for special home maintenance and improvement projects. * Effective Researching of Contractors (otherwise known as “Service Validation"). * Effective Means for Filing Complaints with Related Government Offices. * Additional Info for Residents Making the Best Strategic Choices. 2. UNDERSTAND HOW TO USE IT. EFFECTIVE RESEARCHING OF CONTRACTORS - "Service Validation"
"The leading reason for most successful contract-related home projects is that residents 'do' thorough enough research or service validations on contractors; the leading reason for most unsuccessful contract-related home projects is that residents 'do not' do thorough enough research or service validations on contractors." Opening paragraph of "Effective Researching Of Contractors" from your "SERVICE BOOKLET." This is one version of the "Universal Law Of Home Project Success & Failure"
Paraphrase: Residents who are most successful at getting their contractor-related home projects done are those whose protocol(house rules) include 'always doing' thorough reputation checks on contractor candidates before making a decision. But residents who are the most apt to be tricked by detrimental contractors are those who 'normally do not' have protocol (house rules) for first doing proper reputation checks on contractor candidates before making hiring decisions. Which Resident Would You Much Rather Be? Which Is YOU?